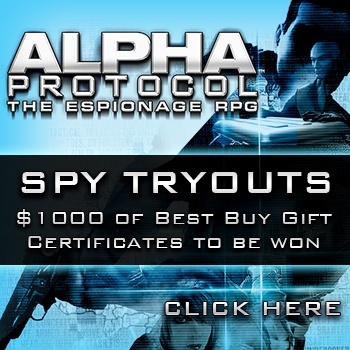 Alpha Protocol Spy Tryouts Have Begun! Becoming an agent isn't easy, but the potential rewards are well worth it, including a $500 Best Buy Gift Certificate. SEGA's modern day espionage role-playing game, Alpha Protocol offers unprecedented control over the development of Thorton's abilities and his interaction with other characters. Upgrade skills such as physical combat, weapons mastery, cutting edge technology and even seduction as you grow in experience and complete missions. And during Spy Tryouts, your choices determine your chance of winning one of five $100 Best Buy Gift Certificates or the Grand Prize, a $500 Best Buy Gift Certificate. This Tryout is not for faint of heart. It is designed to assess your intelligence and drive you to your mental breaking point. If you are one of the elite few and answer all 8 questions correctly, you will receive your first training mission. The others may never be seen again. To begin the Alpha Protocol Spy Tryouts and enter for your chance at a great prize, say goodbye to your friends and click here.